Elephants are intelligent and social animals. In the wild, female elephants stay with their mothers and with their family group for their entire lives. Sadly, there are several female elephants in Florida who are forced to live alone, traveling the state and the country performing at flea markets and other small venues, and with disreputable circuses. These elephants are denied the opportunity to socialize or build relationships with other elephants. Nosey and Florida’s other solitary elephants deserve retirement to a sanctuary where they will find freedom from constant travel and an opportunity for normal social relationships. Update: In November 2017, Nosey was seized by law enforcement in Lawrence County, Alabama and is now being cared for at The Elephant Sanctuary. A court battle continues over custody of the elephant. The Liebling Brothers Circus (a.k.a. Great American Family Circus) is a small circus that travels with one female African elephant named Nosey (sometimes called “Tiny” or “Peanut”), a few horses and monkeys. 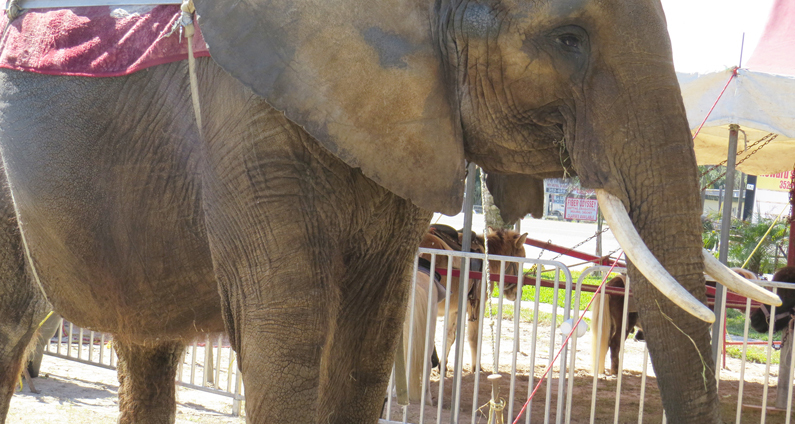 Nosey is used for elephant rides, despite a history of dangerous behavior. In 2004, the elephant knocked a worker down during an appearance in Iowa. The worker suffered a head injury that required stitches. The elephant and monkeys travel together in a filthy, rust-covered trailer. In March 2013, circus owner Hugo Liebel agreed to pay $7,500 to settle charges that he repeatedly violated federal animal welfare laws in his treatment and handling of animals. The U.S. Department of Agriculture (USDA) had charged Liebel with numerous violations of the Animal Welfare Act for inhumane treatment and dangerous handling of Nosey and the two monkeys. The USDA charges included repeated noncompliance with federal requirements for veterinary care, handling, and housing from 2007 through 2011. For example, in June 2009 a USDA inspector visited the circus during a stop in South Carolina and found that Nosey was tethered by two short chains that “severely limited” the elephant’s movement; for over 10 hours Nosey was unable to stand normally. The inspector also noted the elephant’s “extremely poor skin” (Nosey’s cracked and thickened skin has been a recurring problem for the circus). During the inspection, the circus was also cited for leaving a monkey unattended and tethered on a pony’s back for an hour. In March 2009, one of the circus’ monkeys escaped from his cage before a circus performance at a flea market in Fruitland Park (the monkeys are dressed-up like cowboys and strapped-onto a horse during the show). Reggie, a spider monkey, enjoyed his freedom in the wilds of Lake County for one month before being recaptured. Other lonely, Florida-based elephants trapped in the entertainment industry include Annette, an Asian elephant owned by Frank Murray. She can be found performing in circuses, Renaissance fairs and other events. Please contact ARFF if you learn of the Liebling Family Circus, or any circus with elephants or exotic animals, coming to a town near you.